Spanish border at Melilla looking into Morocco. Held since the 1490s this Spanish enclave, along with Ceuta, creates European land borders with Morocco and the African Continent. The border fence consists of 11 km (7 miles) of parallel 3 m (10 ft) high fences topped with barbed wire, regular watchposts and a road running between them to accommodate police patrols. If a migrant succeeds to scale the first section of the border fence, they land on a mess of razor sharp rods designed to inflict grave damage. CETI (Immigrants Temporary Holding Centre). Although official EU documents state "stay in the Centres should be for up to three months", many migrants have been living in this center several years. The boardwalk in Melilla, Spain with a border fence guard tower in the background. A few of the Moroccan youth that live in a detention center in Melilla, Spain hoping to get Spanish papers. Bangladeshi migrants in a camp they built outside the CETI detention center to allude the immigration police who come to CETI in the night and take them from their beds for deportation. A look into the CETI detention center in the Spanish enclave of Melilla. A common story, this migrant from Cote d'Ivoire, is one of the two sole survivors of a group of 9 that originally set off to migrate north. The 7 died at different points while crossing the desert by foot and the sea by boat. This man has now lived at CETI for almost a year waiting either for papers or rejection and deportation. The other survivor still had not made it to European soil. 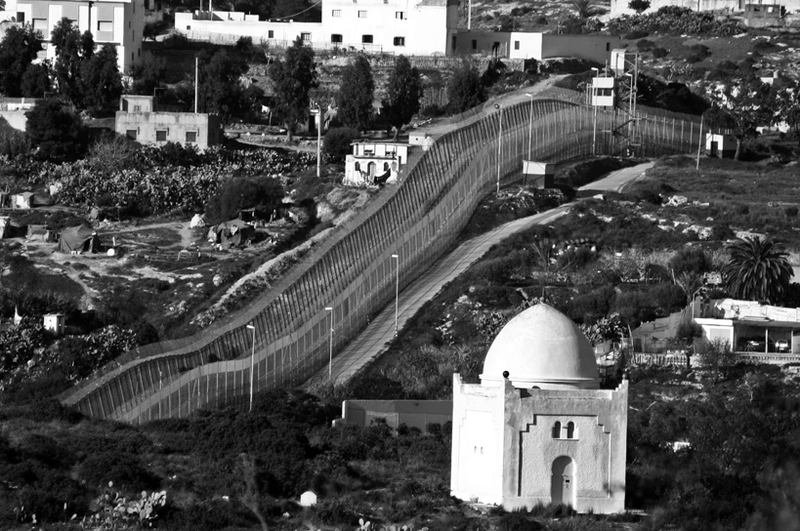 The border fence with a view of the Moroccan troops guarding the other side. Since 2005, repressive measures to secure this border have been put into the hands of the Moroccan authorities in order to leave the Spanish (ie, European) authorities free from human rights violations. A guard tower in the border fence of Spanish enclave Melilla. Many migrants (mostly those from various African countries), attempt to swim over 8 hours in the sea to make it around this deadly border and onto European soil in hopes of getting Spanish papers. Some Moroccans from just the other side of the border have permission to cross on a daily basis. Many set up an open air market in hopes of supplementing their incomes. In the market the average person makes no more then 50 euros a month. A common situation, this migrant from Bangladesh spends nearly 12 hours a day washing and parking cars for spare change. The average income for a day of work amounts to no more then 10 euros. The Spanish border fence cuts across the landscape. Working with the Moroccan youth who hope to obtain Spanish papers before their 18th birthdays when they will be kicked out of the detention center to live in the streets. The boy in the baseball cap turned 18 three months after this photograph. Migrants play checkers to pass the time. Migrants spend anywhere from a couple of months to a couple of years living in this CETI detention center awaiting either papers or deportation. Migrants from Algeria, these men display a CETI identification card. The man in the white jacket has just been served papers that he will be deported. Late at night, these migrants from Bangladesh move en mass to their 'other camp' in order to avoid the immigration police raids that happen in the night. Tents have been brought in to solve the problem of over crowding at the center that at times reaches triple capacity. Of low quality these tents leave many, as these Algerian migrants, flooded out after a rain. In the Bangladesh 'other camp'. It is common for these men to have spent up to 4 years traveling to this side of the border and almost 2 years waiting in the CETI detention camp for either papers or deportation. At times entire families attempt to cross. Very few are accepted as legal migrants and allowed transfer to the mainland. A group of migrants from Bangladesh, many of whom have lived in the CETI camp for almost two years waiting either for papers or deportation. Many say that if deported, their only option is suicide.